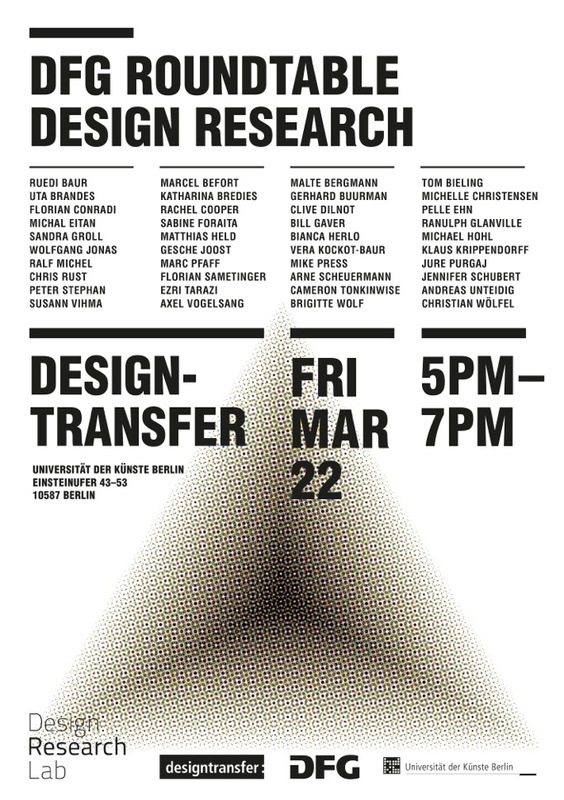 The Design Research Lab at Berlin University of the Arts is looking forward to an intense two-days workshop next week: the DFG Roundtable Design Research. Even more, we are excited to meet our ca. 40 participants. We will keep you up-to-date about the process and outcomes of this roundtable. This entry was posted in Conference and tagged andreas unteidig, Berlin, Bill Gaver, Brigitte Wolf, Cameron Tonkinwise, Chris Rust, Clive Dilnot, design, design research lab, Designforschung, designresearch, designtransfer, dfg, drlab, gesche joost, Katharina Bredies, Klaus Krippendorff, Mike Press, Pelle Ehn, Rachel Cooper, Ranulph Glanville, research, roundtrable, Ruedi Baur, Susan Vihma, tom bieling, Udk, universität der künste, University of the Arts, Uta Brandes, Wolfgang Jonas. Bookmark the permalink.